Camping with kids is a fun thing to do! Many kids enjoy extra freedom when camping because it is so different from where they currently live. That freedom is great but with freedom comes responsibility. Teach your children these 10 camping safety tips for kids so they can have fun, freedom and you can have peace of mind. These camping safety tips outlined here are to help you implement a safety strategy with your children. These tips can provide them with safety education and confidence as they grow. You, as their parent, are the most important person to impart valuable lessons into their lives. You decide what you will allow your children to do. Not every parent has the same parenting philosophy. These camping safety tips for kids will vary in use depending on the ages of the children that are camping with you. When you set up at the campground, have a meeting with your kids and go over the list of where they can go and what they can do. If possible, walk with them around the campground and physically show them where it is acceptable to go and where it is not. In this day and age, having the technology for you and children to stay in communication is possible. There are many options available to you from very sophisticated and expensive gadgets to regular walkie-talkies. Walkie-Talkies are great but can let you down if the kids use them all day to play and then you can’t call them to come back to the campsite. Having extra batteries in your kid's possession can solve that problem. GPS Watches for kids are some of the newest technology that allows you to track your child and communicate with them by their watch! These watches are a great way to give your children some independence and still give you peace of mind. The Buddy System is a tried and true method of camping safety for kids. I was taught this in my girl scout days, and the phrase still sticks with me. Teach your kids never to go anywhere alone! Not even into the campground bathroom unless you have told them they could. Teaching your children about basic first aid is a life-skill they will have forever. Making it fun and non-threatening before real first aid needs to happen will help them remember what to do! These are some great kid-friendly first aid books and actual kits for various ages to make learning about this fun! In addition to having a kid-friendly kit, be sure to have a first aid kit in your camping supplies for the whole family. Make learning first aid a family affair! The American Red Cross offers classes for youth in first aid, babysitting and jr. lifeguarding. Check your local chapter for resources near you. My children took part in some of these classes and they are worth your time. Other first aid and safety resources for children can be found through your local Boy Scouts, Girl Scouts & 4-H Programs. This is one of the really important camping safety tips for kids! Camping usually involves water. A pool, a river, a lake are usually near your favorite camping spots. Equipping your children with the ability to swim is one of the greatest gifts you can give them. Knowing how to swim builds confidence and reduces the risk of potential drownings. This great article can equip you as a parent to guide your children into becoming a life-long swimmer. Your neighbor’s campsite is their temporary ‘home.’ Be sure to teach our kids to respect their neighbors just like at home and not run through other campers’ campsites or use them to take shortcuts. If your children tend to play loudly, help them learn to modulate their voice for their environment, they may be outside, but they are close to another camper. Many campers bring their dog's camping. Educate your children about dog safety. Ask your parent and the dog handler before you pet a dog. Pet the dog on the side of the neck not on the head. Wild animals are in nature. Make sure you teach your children to be aware and alert to their surroundings. Teach them to watch where they are walking. Show them how to avoid underbrush and holes where varmints live. Snakes and small wild animals could live there and be a potential rabies opportunity. Campers & RVers are usually a friendly bunch. But there are a variety of reasons that people are staying at a campground. Some can be there for fun, others for living near a temporary work assignment and others live this way full-time. All people are different with different agendas. Teaching your children about stranger interactions is something that will be a valuable lesson for life, not just camping. If an adult they don’t know engages them in conversation, teach them to speak politely but briefly and move away from the situation quickly. 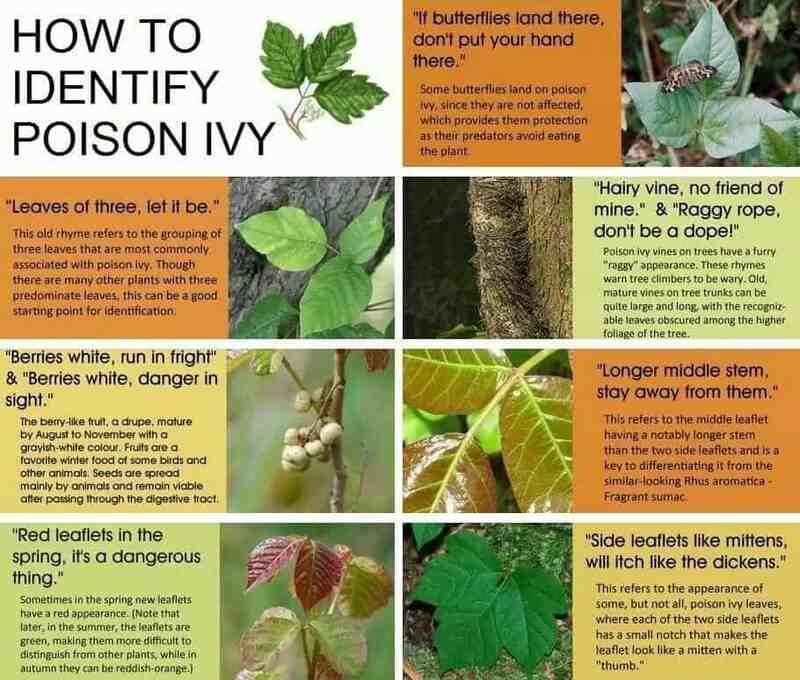 As we all know, camping can be the place to find poison ivy and poison oak without too much trouble! Teach your children to recognize a couple of basic plants to help keep them from getting a very unhappy rash and ruin your camping experience. This graphic can help you teach your children some valuable rhymes to stay out of plants that might harm them. Having a campfire is usually one of the highlights of camping with kids. They look forward to roasting their marshmallows. Now is a great time to teach them about fire safety. Designate a fire circle zone. Use chalk to put a circle around the fire pit so the kids know not to play in that area. A circle of 8 – 10 feet is a good diameter. Teach them to stay out of this circle of safety unless they are with an adult helping them roast their hot dog or marshmallows. For smaller children, have them sit on adults lap or stand in between their legs while they stand close to cook in the fire. Also, educating your children about RV fire safety and including them in making an escape plan can encourage and empower children to know what to do in case of an emergency. These camping safety tips for kids can help everyone feel more confident at a campground or in the woods camping. Kids who have been educated and instructed in camping safety basics will have a better time and so will you! Need to make Campground Reservations? Use this handy log to start making your campground reservations now!